After you have made your contribution, please contact Jeff Von Handorf via email. 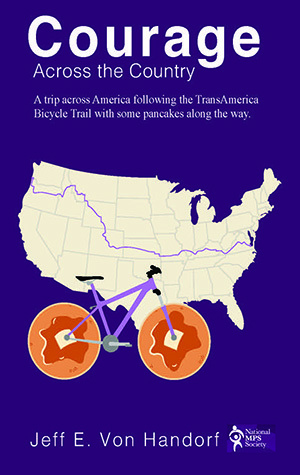 Back in the summer of 2013, I bicycled across the country along the TransAmerica Bicycle Trail with my brothers Jack and Jerry and my sister-in-law Sue in an attempt to raise money for the MPS Society. I have a daughter, Aly, who has San Filippo A. San Filippo A is one of the many mucopolysaccharide diseases that the MPS Society raises money to fund research for a cure and support for families accross the country who have a child afflicted with one of these diseases. Well, I wrote a book about the adventure, and I would like to give you a complimentary copy. I wrote the book in hopes of raising more money and awareness for the MPS Society. All I ask is that you make a contribution to the MPS Society in lieu of actually paying for the book. Your contributions would be tax deductible. You can donate online to the MPS Society at mpssociety.org/donate/. If you are planning a trip similar to ours, the book provide tips to help you prepare for such a trip. If you are planning a trip along the TransAmerica Trail, it would give you a good feel for what you are up against as well as provide you with some logistical help as you make your way across the country. After you have made your contribution to the MPS Society, please contact Jeff Von Handorf at jeff.vonhandorf@boone.kyschools.us for your free book.